Concise details on the Walking in Cantal tour can be obtained by downloading the tour pdf [right]. Alternatively, read the tour description below and click through the sub-headings in the right-hand column for information on access, accommodation, availability, content and prices. New: read some customer reviews at the foot of the page. alking in Cantal takes you to the Auvergne region and heart of the Massif Central. You walk Europe’s largest extinct volcano and its enchanting summits, ridges and valleys. A real walkers’ paradise. In the process you climb the region’s highest peaks or ‘puys’, the original ‘chimneys’ of the volcano. These include Plomb du Cantal (at 6084 feet/1855 metres) and the emblematic Puy Mary. Walking in Cantal is a reasonably challenging tour based on ascents and descents, not distances walked. There are one or two moderate days to reduce the challenge of the whole tour to within the capabilities of all fit individuals who walk regularly. The final day is half-a-day’s walking. And Day 3, so long as you opt for the cable car (open between 15th June and 15th September) is downhill all the way. For your convenience, your hiking tour starts and finishes in the fine Cantalian town of Murat. You walk a variant of The Way of St James [via Averna] to get into position. Once onto the volcano, you walk stretches of the ubiquitous GR400. By the end of the week, having closed the heavenly circle, you will feel an eternal bond with the extraordinary beauty of Cantal. And you are guaranteed to recognize from a distance each and every Puy with which you have had the privilege of becoming acquainted. Walking in Cantal is a liberating experience. It may not help your French language skills. Nevertheless, it should re-fresh your knowledge of physical geography that you considered mere book-learning first time around. Moreover, you get to reflect on the spectacular scenery from the comfortable surroundings of your fine and welcoming accommodations. Not to forget feasting on the region’s culinary delights such as alligot, pounti and the renowned Bleu d’Auvergne and Cantal cheeses. Packed lunches each day are part of the package. B&B: 6-nights in a comfortable and welcoming mix of 3 & 2-star hotels, plus a fine mountain auberge. 5 evening meals, leaving you free to dine out according to your own taste and budget in Murat on your final night, where options abound. All luggage and taxi transfers starting from and finishing back in Murat. 7/7 emergency telephone back-up & support in native English, from 8 ’til late. A scenic Compostella variant – Via Averna. A sumptuous ancient Roman trail. Fine Cantal villages & glacial valleys. Five peaks over 5000′ [1500 ms], incl. Puy Mary (5848′) & Plomb du Cantal (6084′). Four nights in 3-star hotels. 1a. Via Claremont-Ferrand: a regular and direct train service to Murat takes approx. 90 minutes. 1b. 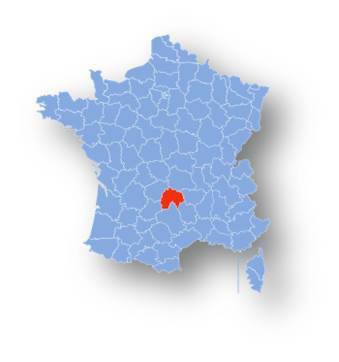 Claremont-Ferrand can be reached from Lyon direct in 2½ hours, or from Paris direct in 3½ hours. 2. From Toulouse, train to Brive-le-Gaillard, where you change for Murat. 3. From Rodez, train to St Denis-pres-Martel, where you change for Murat. See https://loco2.com/ for planning and ticketing. Fly to Lyon, Paris CDG, Rodez or Toulouse. Ask us about the options for parking in Murat – car is left at owner’s risk. Good level of character and comfort, all with en-suite facilities. Day 1: Arrival in picturesque Murat by car or train and hotel check-in. Car parking is available. This is a fine market town with a Maison de la Faune, plenty of bars and restaurants and a worthwhile village walk. Night in Murat. 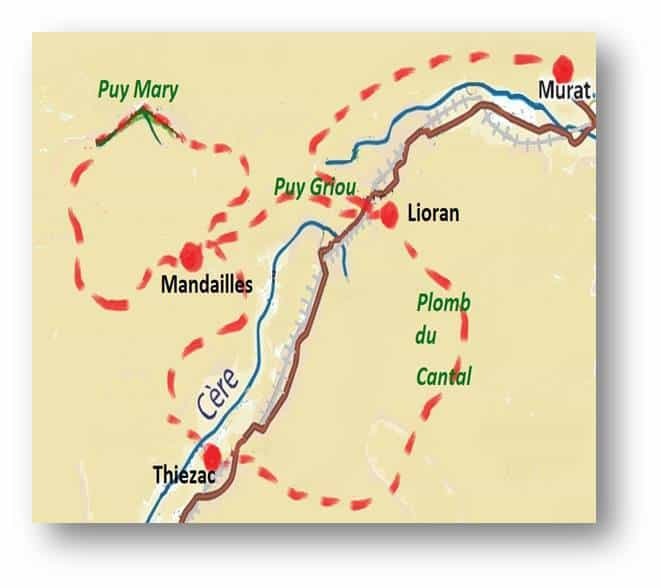 Climb to Murat’s pilgrimage shrine along a variant of the Compostella Trail en route to Cantal’s volcanic uplands, incl., ‘Eagle’s Beak Rock’ and the Teton du Venus, at 1700 ms and 1669 ms respectively before your descent to Lioran and your welcoming mountain auberge with log fire. Either climb Plomb du Cantal [570 ms ascent in 2 hrs] or opt for the cable car [open 15th June to 15th September and costing 10 Euros p/p – not incl.]. Then walk a remarkable Roman trail along ridge and over upland moor. Night in a 2-star hotel in Thiézac. Climb out of the the Cère valley and enjoy some fine countryside towards Puy de la Poche and l’Elanceze and an impressive belvedere over the Cantalian Massif. Night in a 3-star hotel in Mandailles. The piece de resistance and exquisite day’s hiking comprises arguably the top-three features of the Cantal Massif. Morning transfer option shaves 5 kms off the distance – book in advance! Second night in a 3-star hotel in Mandailles. Puy Griou is one of the most endearing of the region’s volcanic cones. Today you get to see it and climb it before your final descent back to ‘Super’ Lioran. Collection from Lioran and enjoy the last evening back in the fine Cantalian town of Murat, where you can choose where to dine out – options abound! Day 7: Departure day – Onward travel by car or train from Murat. Bon retour et a la prochaine! Enjoy some of France's best cuisine, cheeses and the traditional 'punti'. Not-so-super Lioran - so you stay in a nearby popular mountain auberge with traditional log fire. A fascinating journey around the Cantalian Uplands, taking in all the main and memorable sites whilst staying in some fine, welcoming accommodation."